Hawaiian BBQ is the second wing sauce from Bonfatto's that I have had the chance to use. 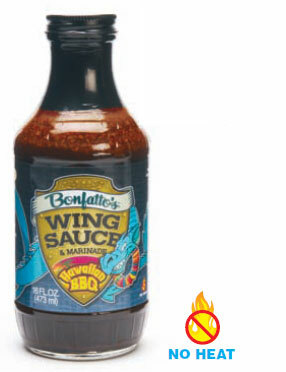 I featured Bonfatto's Hawaiian BBQ sauce in addition to their Razz Hab sauce on wings for my Super Bowl party. I was in need of a mild sauce for some of my guests so the "No Heat" graphic on the bottle seemed to be just what I was looking for. Bonfatto's Hawaiian BBQ Wing Sauce and Marinade is much thinner than Razz Hab. The rich, dark sauce pours very quickly. The sauce is brown with and speckled with a variety of spices. The sauce is sweetened with pineapple juice, corn syrup and brown sugar. It's also contrasted with soy and sesame. All these flavors blend together for a very Asian profile. The sauce reminds me of a thin Hoisin or sesame stir fry sauce. Out of the bottle, the flavors are very strong. The sesame and soy overwhelm the initial sweetness. However, when poured on the wings, the sauce seemed much more mild. The thin sauce didn't stick to wings quite as well as Razz Hab, but was still adequate. While I typically enjoy Asian sauces on wings, I felt that Bonfatto's Hawaiian BBQ lacked the sweetness that I look for. Rather than compliment the sweetness, the sesame flavor is a bit too prominent for me. Hawaiian BBQ was a bit of a let down for me, but I may be in the minority on this one. There weren't any Hawaiian BBQ wings left over on Sunday and I didn't hear any complaints. To learn more about Bonfatto's, visit their website. 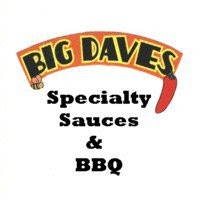 See how Hawaiian BBQ Wing Sauce and Marinade rates on our "Product Reviews" page. 0 Response to "Bonfatto's Hawaiian BBQ Sauce"